I have to apologize to all you gals who made these tissue paper flowers a few weeks ago, because in all my notes I put on my new bulletin board right next to my computer I failed to make a note of the blog I first saw these on. I found this tissue in on of my gift bags from my birthday, it has a pink design on one side and white on the other. I cut 4 sizes of wavy circles by hand(the old fashioned way), 3 of each size except the smallest and there are 4 of them, I layered every other layer printed side, white side. Mash and roll in a ball in your hand, fluff out, poke a hole in the center and attach whatever kind of embellie you like, keep fluffing until you are happy with the results. You can ink the edges if you like, mine are inked with a light pink so you can't really tell. I attached mine to my card with glue dots. 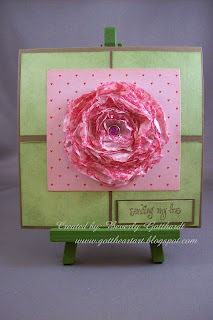 Supplies: Card Blank from Soft Suede card stock-Stampin Up 5 1/4" X 5 1/4", Papers: from my scrap stash, Stamps: Studio G-VS4911 Series 7, Ink: Stampin Up-Soft Suede, CTMH-Z2102 Baby Pink, Z2137 Olive, Stampin Up Pretties Kit-brad colored with pink Sharpie marker, tissue paper, glue dots. Really cute card--how nice to be so full of "Spring" when it is snowing LOL! Your handmade flower is amazing, love it!!! Wow, what a great flower, just fantiastic. Thank you for sharing it with us at Polkadoddles this week. Great flower, so delicate. Thanks for joining in at Polkadoodles this week. Oh I do like these!!!! Thanks for entering the Polkadoodle Challenge - hope you can join us again next week! This is beautiful Beverley. Your tissue paper rose is really lovely. Thanks for joining us at Polka Doodles this week. How cute is this??? I love it! Thanks for playing along with the Color Dare! Hope you join us again! Very pretty! I love that flower!!! Thanks for playing along with the Color Dare!! !